Search box – the keyword search box at the top right of the table. Reset button – the ‘Reset’ link next to the search box which removes the current search/filters. Page length – the “Show <x> products” dropdown above the table. Product totals – the total number of products text displayed below the table (e.g. “Showing 1 to 10 of 50 products”). 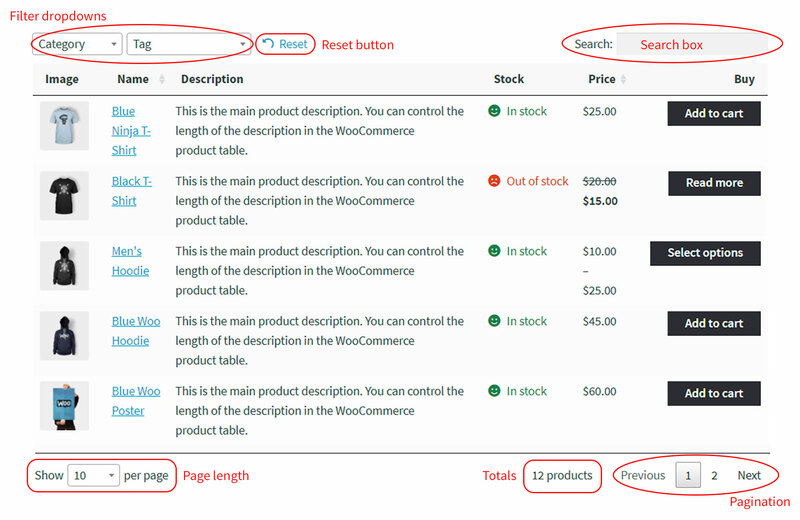 Pagination – the paging options that appear below the table when a product table goes onto multiple pages. Add selected to cart – if you’re using the ‘checkbox’ add to cart option, you can choose whether the ‘Add Selected to Cart’ button appears above or below the table, or both. Please see our article on add to cart options. You can control this option globally on the plugin settings page, or directly in the shortcode for individual product tables. See also: Can I add a search box to my homepage on its own, and show the product table in the search results? The reset_button option controls whether to display the ‘Reset’ button above the table. Defaults to true. Set to false to hide the reset button. The show_footer option lets you show the column headings at the bottom of the table as well as the top. The default is false (i.e. hide the footer headings), but you can set this to true to show them. This option does not appear on the plugin settings page, and is controlled directly in the shortcode. When paging between multiple pages of results in your table, Woocommerce Product Table will automatically “jump” back to the top each time. This is particularly useful if you are displaying a large number of products on each page. The plugin attempts to scroll to the correct position on the page but sometimes it doesn’t quite calculate this correctly. This is because each website and WordPress theme is different and some can have features which interfere with the scroll position – e.g. sticky navigation menus. The scroll_offset option lets you override the scroll amount or disable this behavior altogether. The default scroll amount is 15. If you find that the top of your table is “chopped off” when moving between pages, try increasing this to a larger number (e.g. scroll_offset="50"). If you’d like to disable automatic scrolling, set this option to false.